1,2,3...EasyPC: Sail Away to 50!! My old boss (who I worked for in total for 10 years) recently celebrated an significant "0" birthday. Even though h is no longer my employer, he is still a good friend and I could not let the occasion go by without a card. 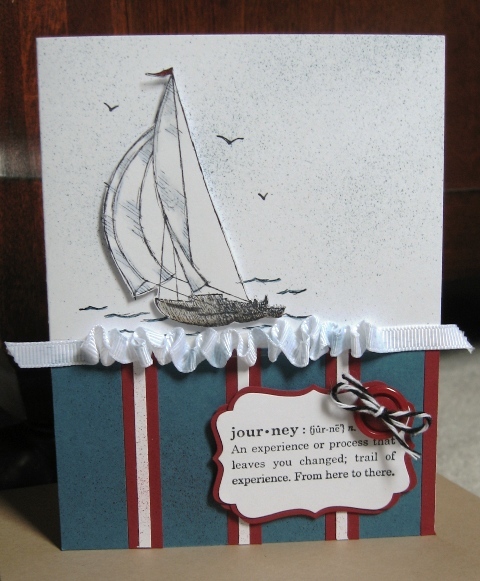 one thing he is passionate about is sailing and the ocean, so it was an easy decision to make the card nautically themed. I kept the elements from the original of the boat, sentiment and self made DP, but I do not have a spritzer, so I stamped off my World Map BGS and used it instead. I also put the boat on dimensionals. Now as you can see, I did not use a button (it was a masculine card after all) and I found a tutorial for the Sailor's Knot here. I got some twine from Michelle at The Stamp Spot and used it to do the knot. BTW.....SOOOOOOOOOOOOOOO happy with the result!! He is a chap that does not like a lot of fuss, so I hid his age on the inside font of the card and made a wee flag from the Pennant Parade set and used some more twine to "hoist it up the mast"!! Thanks for popping by. I know my posts have been a tad irregular at present, but rest assured I have a lot more to share.....in between life in general! !